Polished stainless steel, 43mm case, silver color dial, with Day, Date, & Month, 10 day power reserve indicator, and glass back exhibition case. 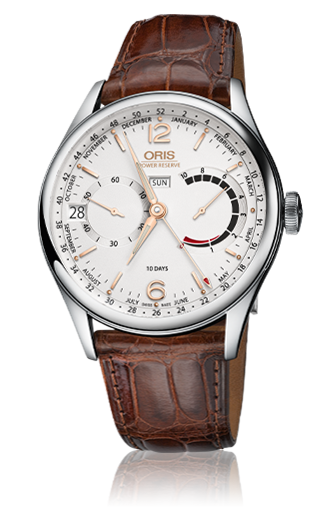 It features a 10 day power reserve all in house mechanical movement encased with an impresseive single barrel. 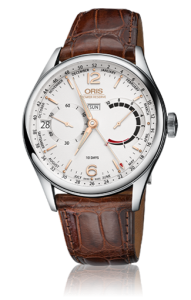 It is available on a sporty yet elegant alligator leather strap with folding stainless steel buckle. PRICE $5900 dlrs. To purchase this watch CALL US 956.687.2981.